Having recently been through the horrifying experience of nearly losing all of my saved progress in BioShock 2 using my offline profile, I wrote a utility that will allow you to create and restore backups of your offline saved games as well as share them with other people. Additionally, this utility can be used to clear out any corrupt saved game files that often prevent you from loading your saved games. This download is freeware. All features of this program are available for all to use freely. I maintain no liability or warranty for the use of this program in any situation. 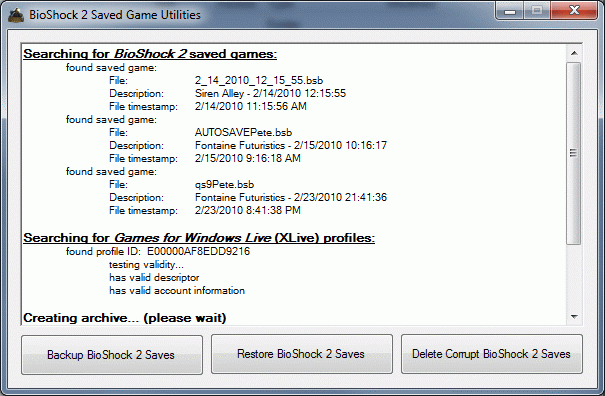 Click here to download BioShock 2 Saved Game Utilities version 1.00 (421 KB).